When was the last time you shouted “Yahoo!”? On Tuesday 28 May, between 4.30pm-6.00pm, Jimi Hunt is hosting a bouncy castle on Queens Wharf so you can shout Yahoo. To celebrate the release of A Bit Mental, Jimi is putting up this bouncy castle and asking commuters of Auckland to kick off their brogues and their high heels, and experience a few moments of pure joy in the bouncy castle. This is the first event of Jimi’s ‘Volom Ask For Help Tour’, a nationwide tour where Jimi will host other events like this. 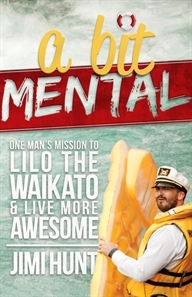 From the man who paddled a Lilo down the Waikato River and created the World’s Biggest Waterslide, you know these events are going to give you an opportunity to laugh and to feel the opposite of depression. 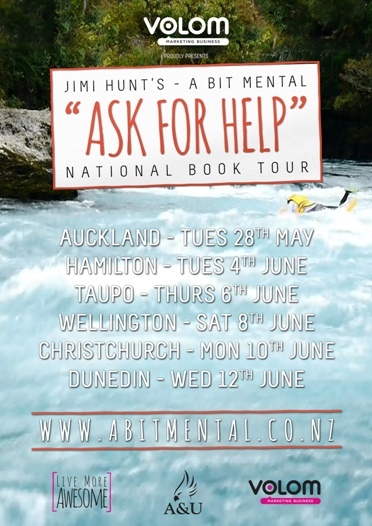 Jimi Hunt is a man who has spent most of his life doing ridiculous things for his own amusement, including coordinating New Zealand’s Urban Golf Championships and Jimi’s Ninja River Adventure. But what none of his friends knew was that Jimi had been silently battling with depression. It was eating him alive from the inside, affecting his business, losing him friends and slowly, painfully destroying his marriage. Disillusioned with the help and advice he received, he read that having a goal could help with depression. Five minutes later, Jimi set his goal and announced it to the world – he would travel the entire length of the Waikato River on an inflatable Lilo mattress. That’s over 400km of paddling, on an unreliable flotation device. With 21,000 people following the journey on Facebook, Jimi faced loneliness and inner turmoil while chancing upon a dead body in the river and learning the exquisite joy in kindness from strangers. Jimi learned some important life lessons on the way that he shares in his first book, A Bit Mental, hoping that everyone can learn to Live More Awesome. Beware the Bouncy Castles. ACC has just this week announced a dramatic increase in adult injuries on these things. Graham especially should avoid them.